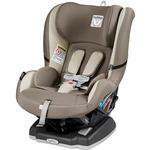 Primo Viaggio Convertible is fastened to the vehicle by means of standard lap or shoulder or lap vehicle belts or using LATCH connector and Top Tether straps according to FMVSS-213 and CMVSS-213 Regulations. 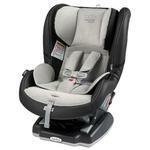 For children 5 to 65 lbs. Maximum height 49”. 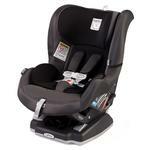 Adjustable Side Impact Protection is easy to adjust in 10 different positions with baby in the seat. Quick-release five point safety harness with shoulder pads and chest clip; harness webbing made with “cobblestone” extrastrong polyster thread . 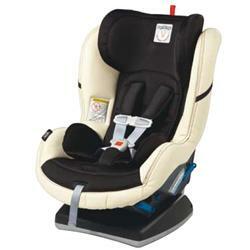 Wide, padded seat; includes a specially shaped removable cushion for newborns. EPS side foam in the shell and in the head panel for superior Side Impact Protection. Gently shaped base with non-friction pads for extra stability. Superior quality fabric; removable, washable covers. One hand adjustment for three different reclining positions for the shell, ensuring the best comfort for the child even when sleeping and during long journeys. 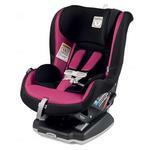 in rearward facing mode for children 5-30 pounds. in forward facing mode by means of LATCH connector and Top Tether strap for children 20-40 lbs. in forward facing mode by means of lap or lap shoulder belts for children 20-65 lbs. The first back seat mirror that rotates 360 degrees and pivots on a ball and socket for the perfect angle to view an infant without moving your rear-view mirror. Attaches securely to the middle of any head rest. 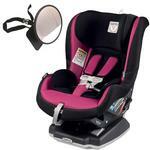 Easy-View does not block rear visibility and does not need to be positioned directly over a child. The shallow convex shape offers the largest, clearest reflection of any back seat mirror. 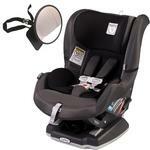 See your baby and see the road easily with Easy-View. 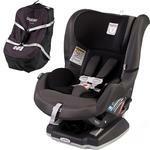 With the Car Seat Travel Bag, you get a versatile accessory that holds ALL Peg Perego car seats. Take it anywhere and everywhere!. Primo Viaggio SIP 5-70 Convertible. Primo Viaggio SIP 5-65 Convertible (Canada). Our Clima Cover was designed to keep your little ones warm in the winter and cool in the summer. 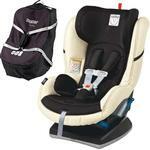 It fits snuggly over the Primo Viaggio Convertible and Primo Viaggio SIP 5-65 Convertible. Made with innovative Tencel material that is made up of innovative microfiber, which helps with temperature regulation. The Clima Cover is the perfect accessory to keep your little one cozy and comfortable. Our car seat cup holder, tested and approved for use with the primo viaggio convertible and primo viaggio SIP 5-65 convertible car seat. The car seat cup holder lets little ones keep their drink close by and securely attaches to the side of the convertible, for easy access. Perfect for bottles or sippy cups, the car seat cup holder adjusts for all different types of cup sizes. Check out our new Bassinet Stand -- perfect for when you want to get a closer look at your little one while they rest in their Bassinet or Primo Viaggio infant car seat. The base of the Bassinet Stand includes wheels, making it easier to move from room to room. It also folds compactly, so you take it anywhere!